A slice the urban Metropolitan Line - or, an LT pannier tank at home! Having received one of these LT-liveried 'panniers' for my birthday a couple of weeks ago, I wanted to rustle something up that looked like its natural habitat. At the same time, I wanted to try ways of re-creating some of the characteristic bits of the Underground, such as the power cables and the four-rail track work. 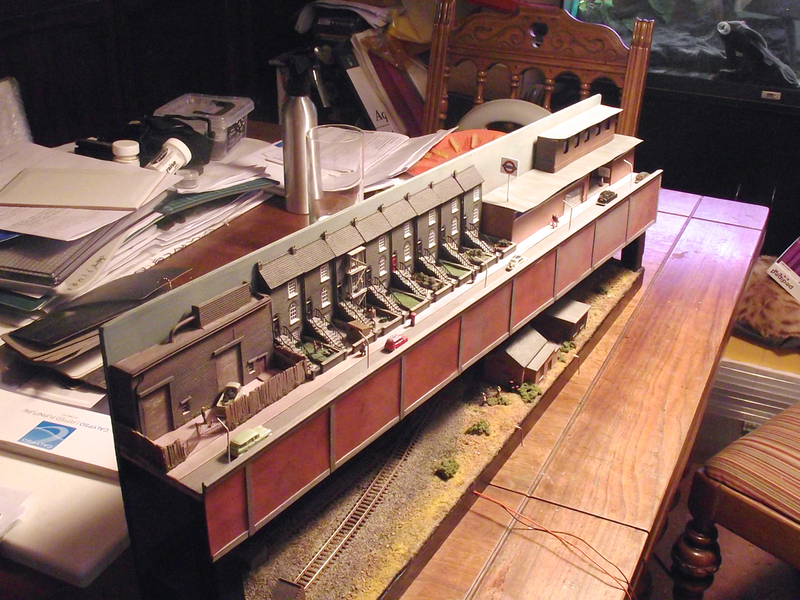 Anyway, the overall view of the diorama, which as you can see is tiny, and designed to be operated from the front. A couple wire-in-tube contraptions activate the points. There is some scratchbuilding going on, with a generic workshop thing at the front of the narrow street, and a tube station at the end. 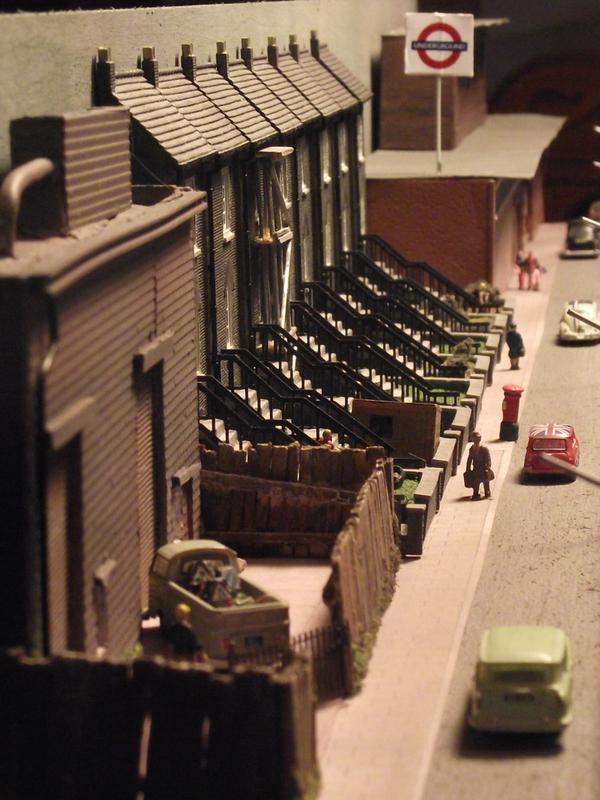 In between are eight of the Farish 'town houses' tweaked in various ways to look more natural. Scaffolding built with my two favourite construction materials -- coffee stirrers and florists' wire! Here's the 'pannier' breaking out from the gloom to catch a little sunshine away from the cut-and-cover line running underneath the street. The street is actually built on a balsa and card skeleton held in place with magnets, so lifts away from the track work, making things like ballasting and re-railing rolling stock much easier. 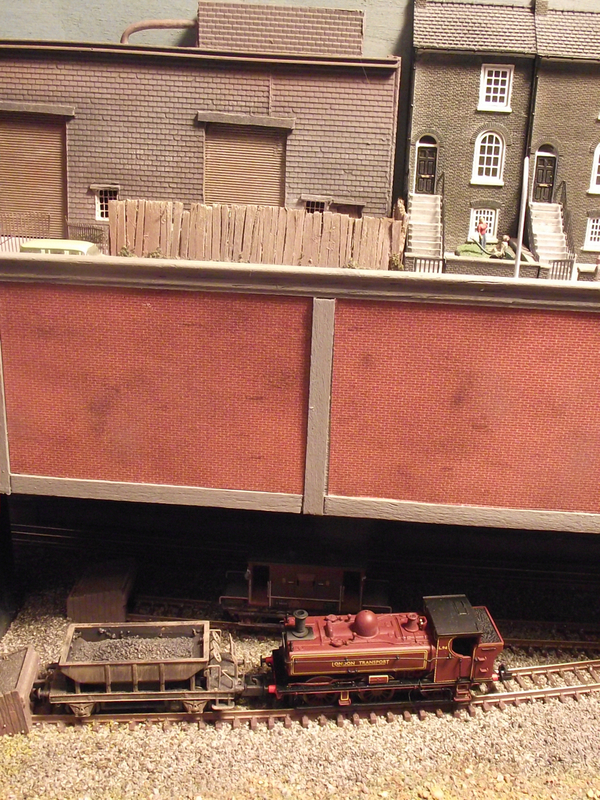 With the street lifted away, you can see that the two extra rails of the four-rail track work are nothing more than spare rail glued onto the sleepers, suitably filed at section breaks to look more realistic. Since the track is normally half-hidden in gloom, the crudeness of this approach isn't that big of a deal. I have absolutely no idea what these arch things are called, but they seem to be common on the Underground and I think they carry the power wires from one side of the track to another. 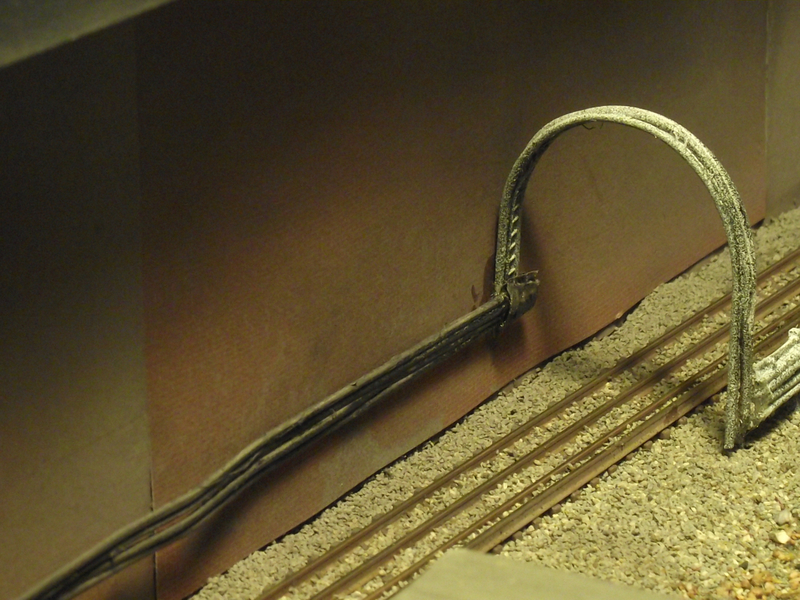 Both wires and the arch are built from florists' wire, which is very cheap and easily shaped. Again, this structure is mostly in shadow when the street is in place, so 100% accuracy isn't something I needed to worry about too much. It's barely an Inglenook in design: a single 60-odd cm length of electrified track with two short, non-electrified sidings coming off it. 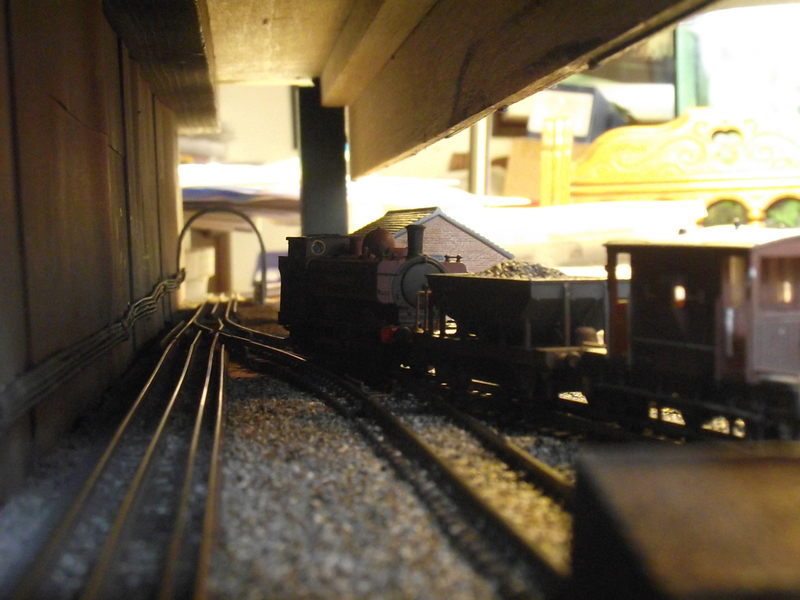 While it's wired up to work, but I don't think this layout really goes much beyond a diorama. But I think it evokes a London feel quite well, and I'm now thinking about how a full-size Metropolitan Railway-type layout might work. I know that @captainelectra is working on some LT trains, and there is some stuff from Radley Models too. London Transport seem to have used 'Dogfish' wagons and more or less standard issue BR brake vans, so there's actually rather more stuff out there than you might think. Re: A slice the urban Metropolitan Line - or, an LT pannier tank at home! It's in no way my "thing" or region or much else really, but it is however a truly remarkable and atmospheric little "thang" you've got going on there. I've travelled a fair bit round the underground over the years and you really have captured the feel and atmosphere. You ought to be rightly proud of that. What an excellent tableau. Top work Nemo. 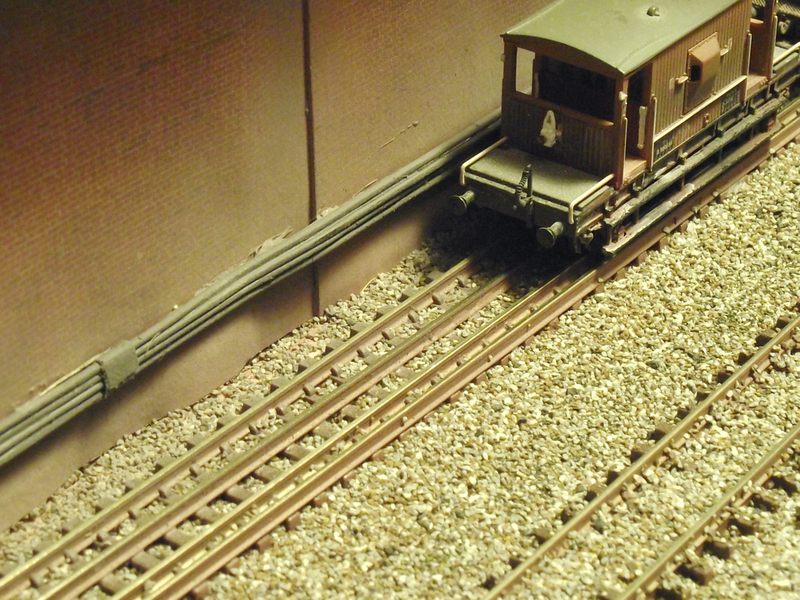 Just going to add another shot, this time looking along the electrified line with the street section in place. I like the look of the four rails and the power cables on the wall (and that arch thing, whatever it is). 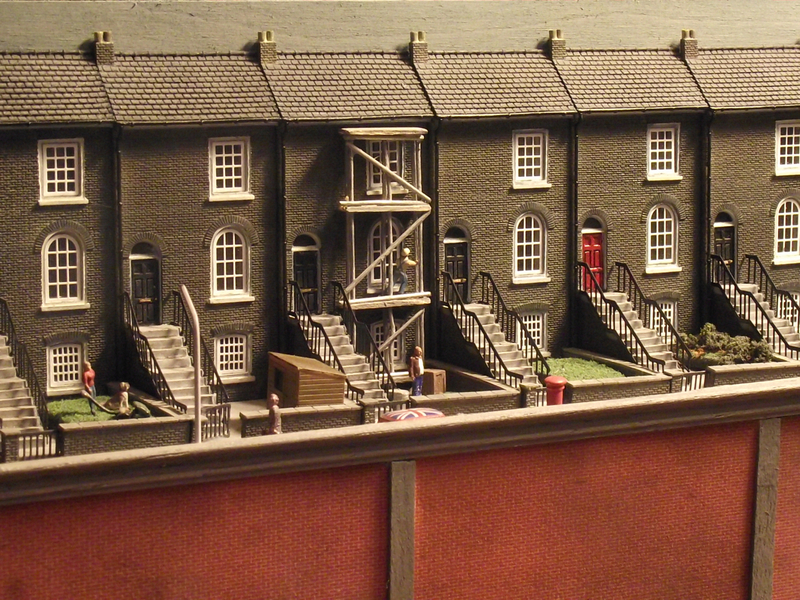 Excellent stuff - really nice modelling. That's a stunningly imaginative piece of work! Thank you for sharing it with us. It looks like a labour of love. A marvelous piece of work, NeMo. Triple up, mate. Lovely bit of work Nemo. Love the way you start the thread with 'I wanted to rustle something up'. Very nicely done, sir. You've certainly captured the look and feel of the Tube. And in only "a couple of weeks"! I've had mine for a couple of years and all I've managed to rustle up is a few wistful dreams. Cracker of a scene and great work!